At first pass, you may assume the literal definition. In some instances, you would be right. By the very nature of our work, we “think” outside every day – whether we’re mowing a lawn or estimating a project. However, we interpret this phrase in more ways than one. 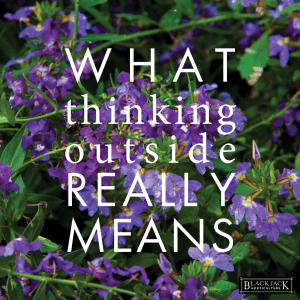 We have adopted it as our company tagline and want to share with you what it means for Blackjack Horticulture to “think outside” internally as we strive to follow the four core values that shape our work externally. We live in a culture that prizes immediate gratification and individuality. Accomplishing the bare minimum – without exerting too much energy or working too hard – is the new standard. Cost-effective and time efficient, what’s wrong with that? Not so fast. This train of thought is a slippery slope. If we operate out of a rationale that prefers convenience to thoroughness and production instead of professionalism, our inclination will always be to “cut the corner.” It dangerously devalues excellence and hard work. The weekly stress and pressures we face will guarantee that attention to detail and exceeding expectations cease to exist. At Blackjack Horticulture, our attempt to “think outside” goes beyond what our hands can touch. It encompasses something much greater – an attitude and mindset manifested in one’s actions. But this is a choice, and not always an easy one. While it may be faster to plant flowers without laying them out, excellence ensures they are evenly spaced and reliability adjusts the design when necessary. “Think outside” is not just a slogan; it’s how you choose to work regardless of the demands and deadlines. At Blackjack, we are actively trying to reinforce this line of thinking in each of our divisions. Sometimes we succeed, sometimes we fail. But the four values listed below are our way of inching towards a company lifestyle of “thinking outside” in everything we do.